Published: May 9, 2014 to ? The story centers on "Chronos Rulers," those who fight the time-eating demons that appear when people wish they could turn back time. The Chronos Rulers fight a time-manipulation battle against these demons. 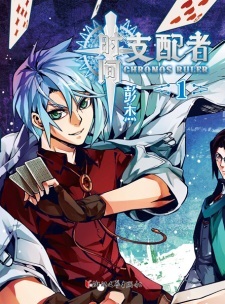 The Japanese version of Chronos Ruler has been serialized in the web magazine Shounen Jump+ since March 26, 2015 under the title Jikan no Shihaisha (時間の支配者). Imagine someone stole your time, you‘re beginning to loose your latest memories, you forget what you did yesterday, last week you even forget who your son is, while your body gets younger and younger. Sounds rather nice huh? Well, I thought it was (until the last couple chapters; we don’t talk about the couple last chapters). And since nobody wrote anything about this series I thought why not. (Disclaimer: I have only read the chapters published in Japan, since it the serialization was dropped there after ch.77). You won‘t get any conclusion to anything, which is a big letdown, just to let you know. Just read the first couple of chapters, it will catch your interest. The story has lots of potential, which is lost while the story goes on. Maybe it picks up in the later chapters, I’ll never know. You have your always funny and carefree seeming MC, who can be pretty serious, you have the meany serious side MC, you have the cute annoying seeming Main Girl, you have the side kicks like the dumb boy who gets to violent, yeah your typical set of characters you would expect. I especially liked the relationship between Viktor and Kiri. It’s good, I can’t complain. I don’t get the terrible rating this got, I knew the beforehand the anime for this series is supposed to be terrible but after reading through the manga blind, I didn’t get the hate for it (story-character-artwise). Translations for the publishing Chinese Chapters ?